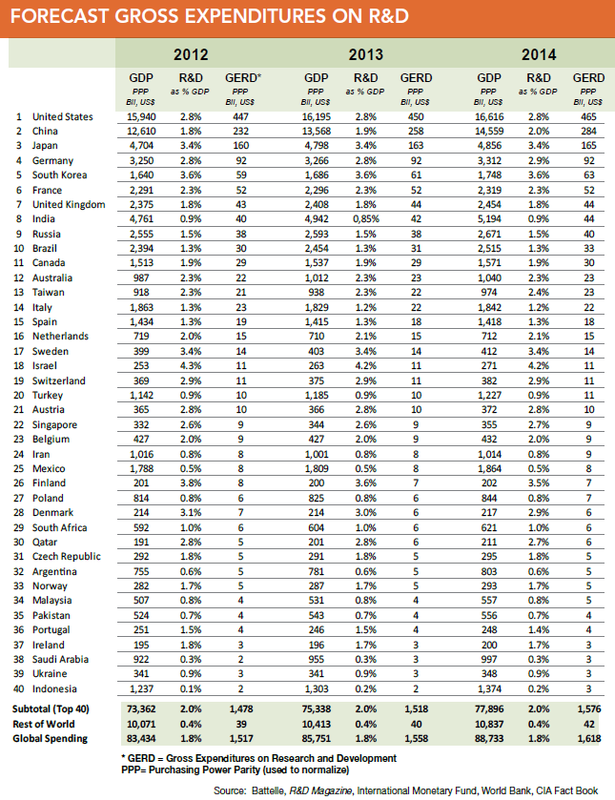 The 2014 forecast is now out and Israel once again outclasses all other nations, consistently above 4% of GDP. Switzerland is in about the same league as USA, Germany and Austria. In Europe, the Nordic countries, except Norway, are the leaders in R&D funding as a percentage of GDP. In Asia, South Korea and Japan seem to lead. But of course in terms of the amount of money going into R&D, USA and China have the bigger gross expenditures. In 2014, ten countries will spend about 80% of the total $1.6 trillion invested on R&D around the world; the combined investments by the U.S., China and Japan will account for more than half of the total. Together, the U.S., China, Japan and Europe account for about 78% of 2014’s $1.6 trillion total. Most Arab Middle East countries are expected to experience strong GDP growth in 2014, but are constrained by weak, or non-existent, R&D infrastructure. Africa is expected to see strong GDP growth, but is also limited by under-developed R&D capabilities—with the exception of South Africa.